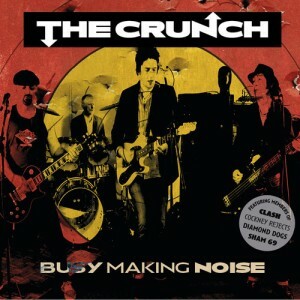 The Crunch are actually something of a super group given they consist of Sulo Karlsson (Diamond Dogs),Terry Chimes (Clash), Dave Tregunna (Sham 69) and Mick Geggus (Cockney Rejects).That's certainly a line up which has a terrific pedigree of former bands. It is quite clear, however, that this is not a group of guys getting together to milk their back catalogue and go through the motions. This album certainly doesn't serve up a load of rehashed second rate punk numbers. In fact, it is the opposite as it contains a set of songs which are fresh and exciting. The title track opens the CD and it comes as a bit of surprise given the backgrounds of the artists involved. It has a really melodic and quite a 'pop' sound. It really is a very modern sounding punk pop sound with great care free lyrics. The second track does add a touch more grit but again it is still very upbeat and melodic. It actually sounds similar to Michael Monroe's new stuff in that it has that Hanoi sound but with a melodic/modern influence. This style is also seen on "Right About Now" which again has a punkier influence coming through. On "Down By The Border" you can hear echoes of The Clash in the guitar line and the beat and it is a reminder that they also did some great pop flavoured songs and this could certainly be them at their most commercial. It is certainly no surprise it is one of the singles from the album, as it has a real power pop feel to it. "Looking For A Blaze" is another upbeat modern rock song and is surely another single candidate given it is melodic, catchy and addictive. They importantly also change the tempo with "Yesterday's Boys And Girls" which has a ballad type sound with the opening vocals and piano. The song quality is maintained and this song has an added sense of depth and warmth. In fact, if it wasn't for the fact it sounds like it comes from the heart, it could have easily been an epic modern rock hit! Similarly, "Remember Me Like That" is another slower one, but it avoids being schmaltzy and soon builds in to a full blown chorus. "Gangster Radio" really does have single written all over it, which is ironic given the lyrical swipe it takes at the BBC and the commercial music world. "Matter Of Time" sees a reggae type beat influence in the song before again turning in to a driven chorus which would serve as a great beer in the sun song. The overall power pop feel again shines on "Little Bit Of Grace" which has a brilliant opening and also benefits from an excellent co -vocal performance. The band then slow things down again with "Floodlight" which is their lighters in the air, sing a long song. This more restrained approach continues on the opening of "Ruin Of A Heart" but this soon rejoins many of the other songs in being a power pop strum along. The whole album then, quite rightly, ends with the upbeat rocker "Runaway Son". It brings everything to a close with an excellent high of good time, pop, rock n roll.